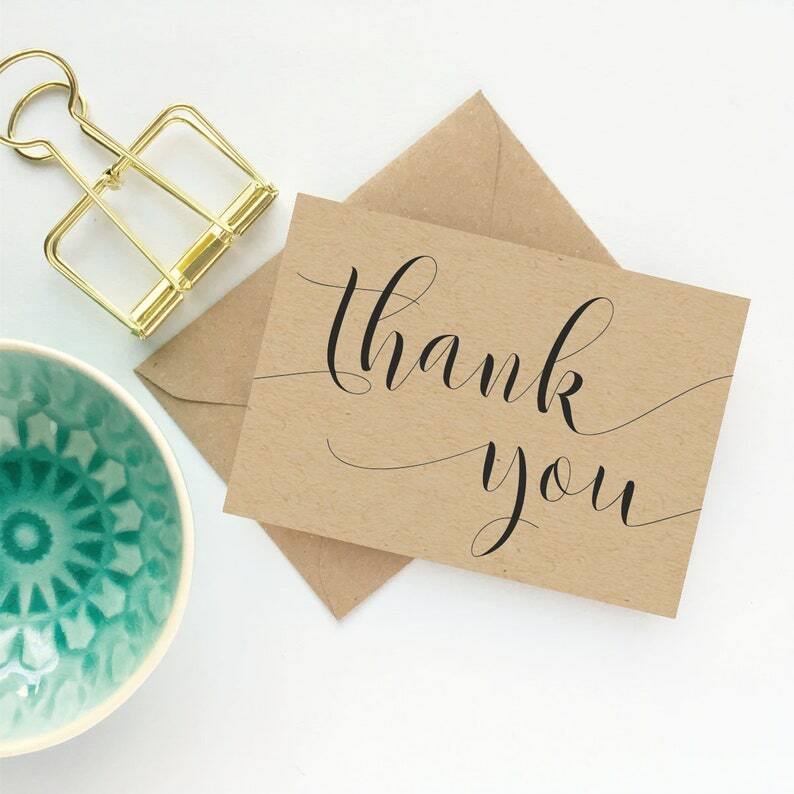 These lovely mini size thank you notecards with envelopes combine the rustic look of the recycled card stock with the elegant styling of the text and are a great way to say thank you. The recycled nature of these cards gives them a lovely handmade texture with natural fibre flecks. Check out our shop for our other paper goodies! Wedding Thank Cards with envelopes, MINI size thank you note cards Rustic wedding thank you notes Personalised 10pk Printed. Blank inside. Loved the cards! They were well made, simple yet a perfect thank you card! Came exactly as pictured. Great quality and met our needs perfectly! Loved these! They worked perfectly for what I needed them for! Please contact us if you require a custom order on anything listed in the shop. All our measurements are approximate so if you need something in a specific size or want to check it will fit your needs please message me. All orders (excluding printable items) are shipped by standard airmail which isn't tracked. If you'd like tracking on your order, please select this upgrade during the checkout process. Printable Purchases - Will you ship this item to me? As this is a 100% digital product no physical item is sent. Instead you’ll receive your digital files immediately after purchasing, saving on both time and shipping fees. Together we’re also doing our bit for our lovely planet, saving on packing and transportation, which has got to be a good thing! So, no waiting around for it to arrive; after purchase it will be there waiting for you to download and you can get on with your day! Can I get a refund/cancel my order on my digital order? Above all I want you to be pleased with your purchase but as the products are digital goods delivered for download, I don't offer refunds. If you change your mind about your purchase and haven't downloaded the product (which I will check with Etsy prior to responding) then I will happily assess your request and respond. Once a purchase has been downloaded I will review each request for a refund on a case by case basis, but please get in touch within 7 days of purchase and bear in mind that as a rule we don't offer refunds once the item has been downloaded. Thank you for your understanding on this. Please don't hesitate to get in touch if you're having any problems with your files - I want you to be totally happy with your purchase. We welcome wholesale orders and can tailor items to reflect your brand. Please get in touch to discuss. to allow for processing time and delivery times if ordering time sensitive items. Please contact us if you require your order for a specific date so we can advise accordingly. We cannot guarantee delivery times and these are approximate. For items - in particular greeting cards - being sent direct to the recipient please let us know so that we can pack the order accordingly.